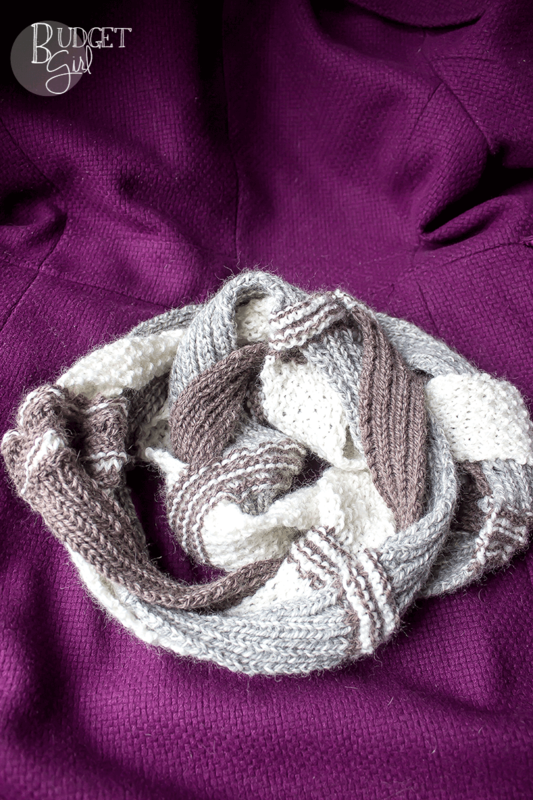 The challah infinity scarf is a textured, chunky-looking scarf using moss stitch and rib stitch. It’s worked in three strips that are braided and stitched together to create its unique look. 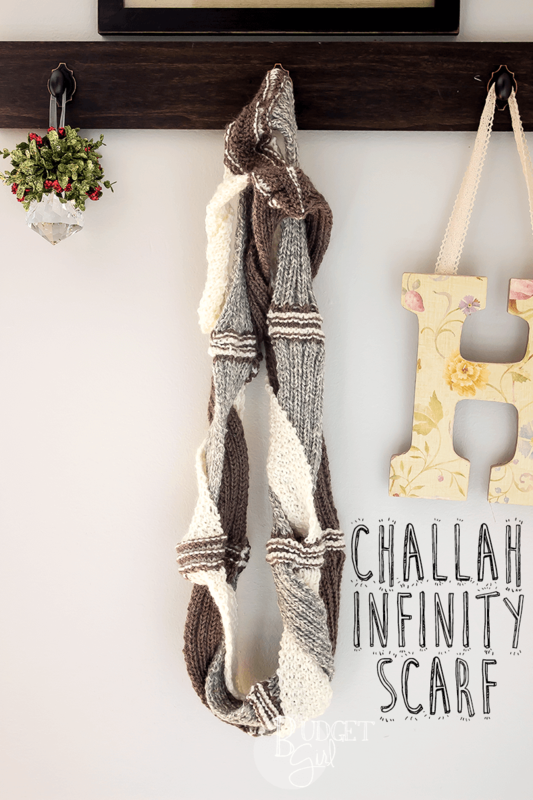 Last year, I found a pattern on Craftsy called the Challah Infinity Scarf (which the author states is inspired by the look of Challah bread). It was beautiful. It had so much texture and it looked so cozy. So I purchased the pattern. I immediately knew my sister-in-law would like it. She loves textured knits. I didn’t have time to make it for her last year, plus I was working on a bunch of other things (like the rainbow hue shift blanket). But I managed to get around to it this year! It was actually her Christmas gift (which is why I’m posting about it now, rather than when I finished it a few weeks ago). It turned out REALLY nice. I won’t post the pattern, but there is one bit I want to discuss. The braiding was more complicated than I expected it to be! I’m not sure why. Braiding it without twisting the garment gave me a lot of trouble. And I made a mistake in the type of stitch I used for sewing the ends together. Next time, I’ll use mattress stitch. But I also had a hard time seeing the BO stitches (my CO is always super loose, but my BO is really tight). Other than that? It came out perfectly! I ran into a couple hiccups with the middle strip (which is moss stitch, but I kept forgetting which row I was on. So it came out as seed stitch in a couple places and rib stitch in others. But it’s not too noticable and just adds more texture). I’m actually really interested in trying this pattern again. I had a lot of fun with it. 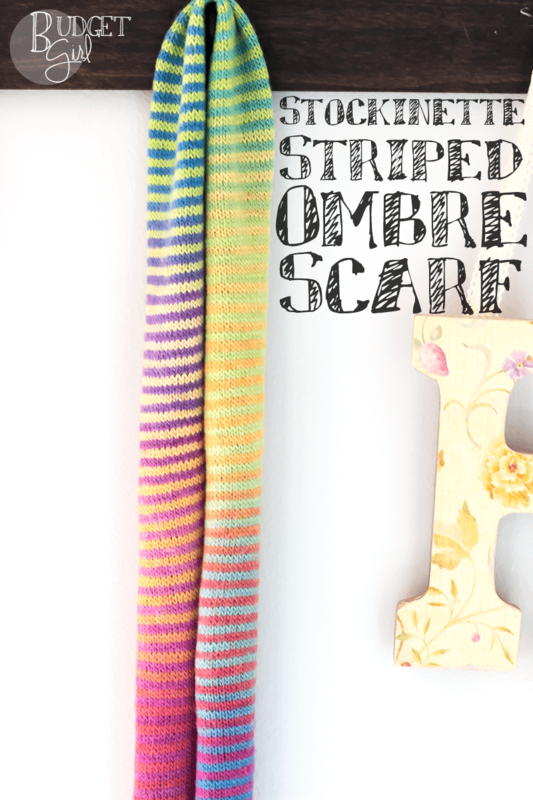 This and the stockinette striped ombre scarf are the most fun I’ve had knitting scarves. The ombre because of all the color changes, and this one because every time I got bored with the pattern, it was time to start a different strip. It definitely did not get boring. And having six very distinct sections made it easy to track my progress. There’s something about having a definite end spot that makes a project seem less daunting. The only changes I made were with the yarn and needles. 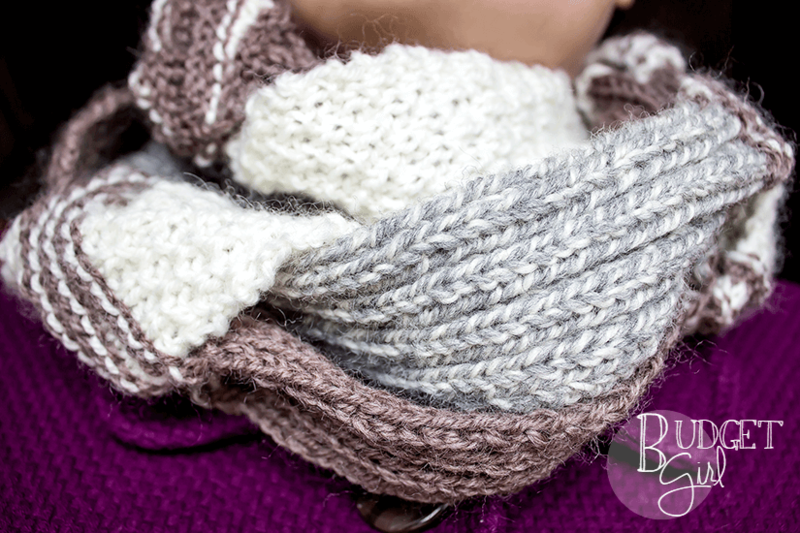 I like the look of the tricolor scarf, so I used three different colors in Paton’s Classic Wool–taupe, aran, and grey marle. The reason I went with these was because they were at Michael’s and I liked how they looked together. I got one skein of each. And I used one pair of US 10 circular needles, 2 stitch holders, and a yarn needle for weaving in ends (which I did as I went, to make it easier to work with). It’s actually really helpful to use circs instead of straight needles here, so you can slide strips on and off without disturbing everything else. Anyway, this is more of a review than a pattern post. I just REALLY love the Challah Infinity Scarf right now and I highly recommend purchasing the pattern and trying it out for yourself.